It’s very rare that I stay in the UK when I need a getaway – every time I start to plan a UK trip the cost adds up and it almost always works out cheaper to go abroad. Cheap flights win over expensive car hire every time! I recently wrote a blog post about coping with mental health abroad (which you can read here), in which I said that I was planning to go away at the end of February but anxiety got the better of me and deciding where to go, booking flights and researching a new city felt too much. Just hours after that decision had been made, an email from The Yorkshire Food Guide popped into my inbox with a very tempting offer… an overnight stay at The Black Swan Hotel in Helmsley including breakfast and dinner for just £179. The idea of a quiet couple of days in a cute Yorkshire market town felt like the perfect way to relax, so I booked the room and headed off to Helmsley a week later with Billy in tow. Now I never planned on writing a blog post solely reviewing the hotel, but we had such a lovely time here that I had to! So here it is. As we drove into Helmsley, it wasn’t more than a few seconds before we saw the hotel in front of us, right next to the market square and in perfect position for exploring the town. Our check in time wasn’t until 3pm and it was only 11.30am, but we thought we’d try our luck and see if we could check in early. As luck would have it our room was ready, so we headed straight up to drop off our bags. The Black Swan Hotel was cosy, warm and welcoming from the second we walked in, and we instantly spied a log fire and two armchairs… no guesses needed for how we would plan to spend our evening! As we approached the reception desk, we were welcomed by a receptionist so friendly that he had already made my stay before I’d even got to the room. 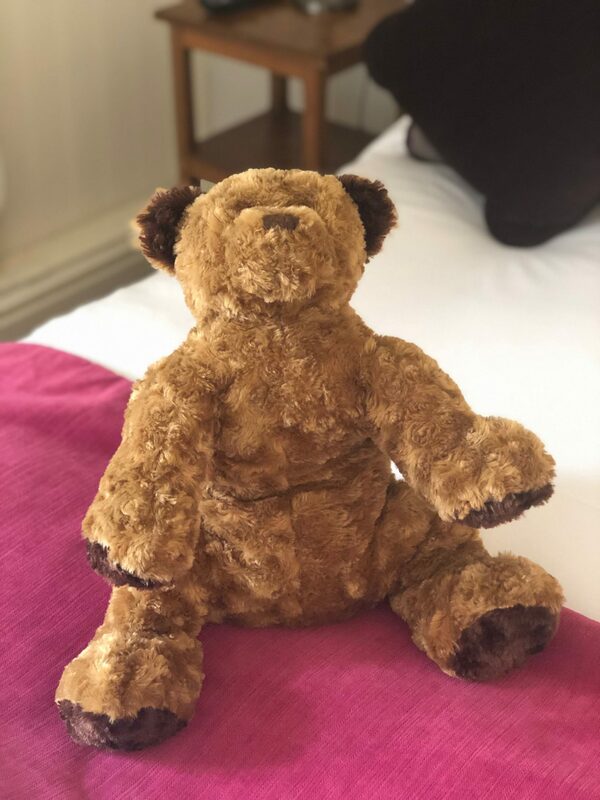 After some narrow, creaky corridors and stairs we arrived at our room where we were welcomed by a teddy bear on the bed! The room was a good size and lovely and light, and the bed was HUMONGOUS!! I was already so excited to sleep in that bad boy. The room also passed the Billy test, which means that there were biscuits, so everyone was happy. The room had an en-suite which had everything that we needed, and although it was slightly dated it was spotlessly clean and full of lovely products! The bath was a little on the small side… trying to be romantic Billy and I attempted to have a bath together, but in reality we flooded the floor as the bath overflowed, it was highly uncomfortable and we had to prise our way out when we literally got stuck. At least we tried. The most important part of the stay as always, and it did not disappoint! Actually, the food was outstanding. Within our package there was a £45 per person allowance towards the main à la Carte menu so we booked a table for 7.15pm and headed down to the bar about an hour earlier for a pre-dinner gin and tonic by the log fire. The fabulous service started in the bar, where we were brought the menu and asked what we would like to order, before being left to enjoy our drinks and the comfortable armchairs until it was time for dinner. We were then taken through to the 3 AA rosette restaurant, where the cosy feel of the hotel continued. 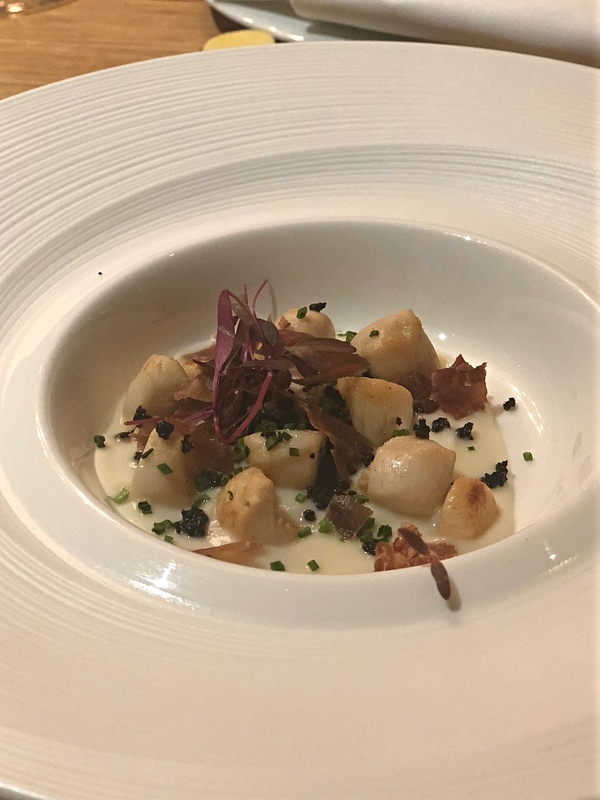 Billy and I both chose a starter of queen scallops (I don’t think there’s ever been an occasion where scallops have been on a menu and I haven’t ordered them) with parma ham, a black pudding crumb and a cauliflower puree. The portion size was perfect, and the food was delicious. For the main course we shared a beef wellington. At £80 it’s a little indulgent, but I can confirm that it’s worth every single penny and probably a lot more! 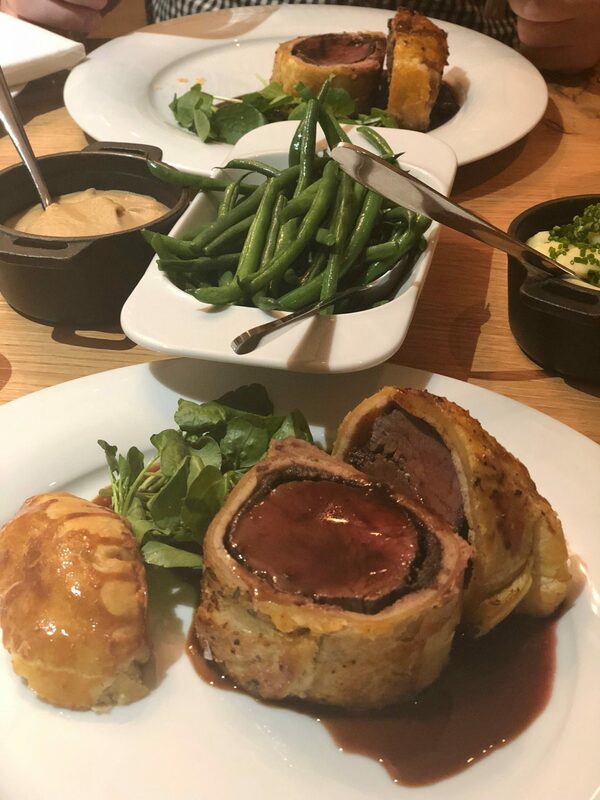 The Wellington was brought to our table on a trolley and carved in front of us, revealing a beautifully pink centre… I was drooling by this point. We were told that the ends wouldn’t be served as the pastry isn’t usually as good here, but Billy asked for it anyway (it was fine). It was served with buttery mash, celeriac puree, green beans and a red wine jus and it was one of the best things I’ve ever eaten. 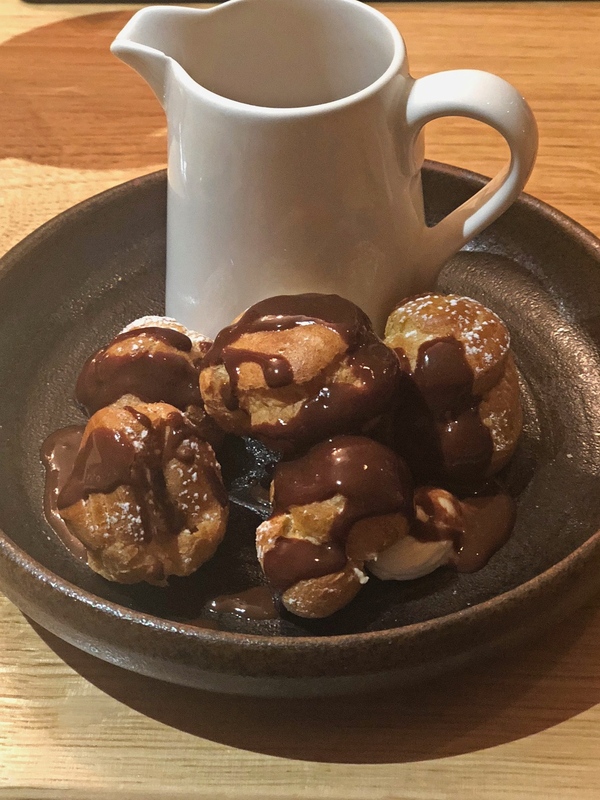 For dessert I ordered praline profiteroles with Belgian chocolate sauce, which were lovely but also completely out-shined by Billy’s choice… the cheeseboard. 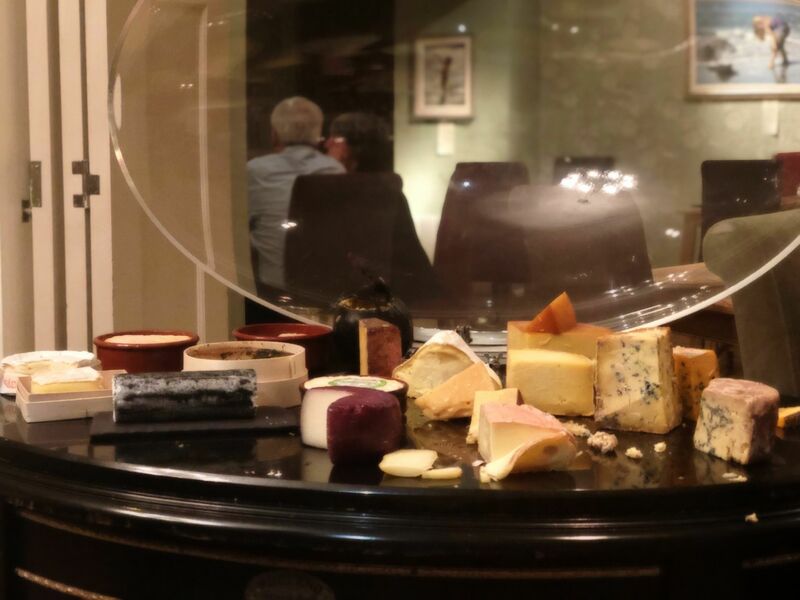 I have never in my life seen a man quite as happy as Billy when the waitress wheeled over the cheese trolley, which consisted of at least 20 different cheeses. As she talked him through each cheese you could see in his eyes that he could hardly contain his excitement, and I could almost hear his brain ticking overtime as he decided which 5 cheeses to go for! Obviously I sampled a little of each of the cheeses, the smelly French one being my favourite. Billy’s description of this was that it smelt “like when you open up a Tupperware that has week old chicken in” but he loved it all the same. Our food experience wasn’t over with dinner, as breakfast was also included. A little hungover from too much red wine, we both opted for the full Yorkshire breakfast. The Nidderdale sausages were the highlight of the breakfast, but it was all great and set us up for another day of Yorkshire exploration (but first a quick post-breakfast nap). I know I’ve already mentioned this twice, but my favourite part of the trip was sitting here in the quiet bar after the other hotel guests had gone to bed. 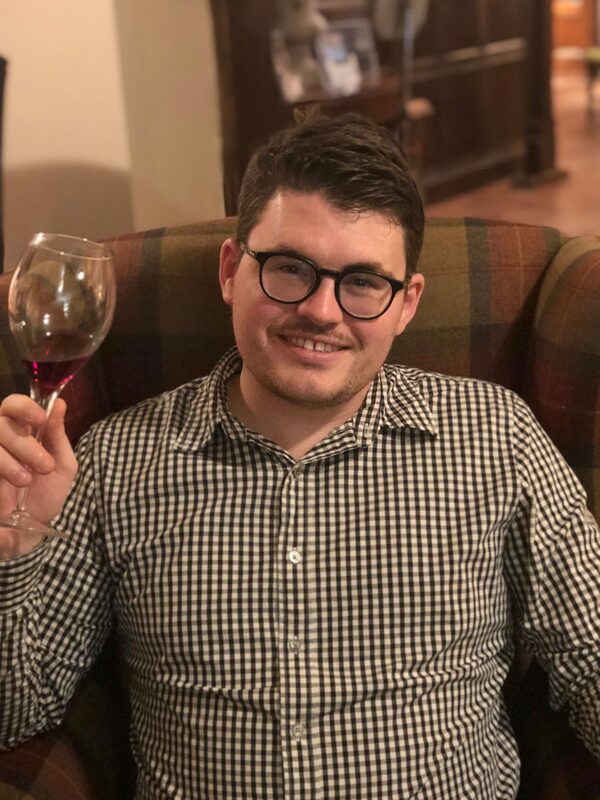 Extremely full from dinner, Billy and I settled in to the fireside armchairs for the evening, and proceeded to drink three bottles of truly fantastic red wine whilst reminiscing, talking about our future and putting the world to right. I don’t remember going to bed too clearly, but I had the happiest, most content sleep! The hotel is pretty old which might not be to everyone’s taste (not everyone likes low ceiling and uneven floor), but this meant that it was full of character. Our room was clean and airy, the bed was big and comfy, the food was amazing and thoughtful staff resulted in fantastic service. I absolutely can’t wait to return again soon! I’m very glad that I’d already had my lunch when I read this. I was drooling. Sounds like a lovely place. I hope you’ve sent them a link to your blog. I was drooling whilst writing about it, it was fabulous. And yes I have done don’t worry!